"Whoever has the conch gets to speak. That's the rules." In William Goldings chilling 1954 novel Lord Of The Flies a group of young English schoolboys become shipwrecked on a remote tropical island, and without the guidance of any adults, begin a slow descent into brutal savagery. Goldings book has become a literary staple on the human condition, and was made into a perfectly disturbing 1963 British film by Peter Brooks; a film that was even more startling due to the eerie black & white cinematography of Gerald Feil and Tom Hollyman. If you've seen the Brooks' version, and been haunted by the dramatic and doomed rites of the stranded boys in that film, it would be understandable that you might be more than a little skeptical about the necessity of this 1990 remake by director Harry Hook. Retooled significantly for American audiences, Hook's version came under fire for downplaying some of Goldings original symbolism and attempting to create a slicker, Hollywood product. Not only did the comparisons to the original novel plague Hook, but it befell the unfortunate and inevitable comparisons to Brooks' more primal film. In defense of Hook, this is not the first book-to-film translation that has tweaked the author's original message, and it certainly won't be the last. The core of Goldings original story remains here, though purists may argue that point, and it is still a very powerful one at that. The Sara Schiff screenplay updates things slightly by replacing the English students with a group of young American military cadets, ranging in age from around nine to fourteen. After their plane crashes, the boys find themselves washing up on a lush, green tropical island. Without any adults, except for the gravely wounded and delirious pilot (Michael Greene), the young boys must fend for themselves in order to survive. Led by the rational and clear-thinking Ralph (Balthazar Getty), the group is forced to band together to erect shelters, seek food and more importantly, develop a social order. It's not long before a rebel arises to challenge Ralph's attempt at organized survival, in the form of fellow student Jack (Chris Furrh). Jack eventually splits from the group, along with a band of dissenters, creating a separate 'tribe' known as the 'Hunters.' Jack's group quickly evolves from being simply hunters of wild boars, to a ravenous pack of war-paint covered savages. As Ralph's power base diminishes, and Jack's grows, the struggle between the two groups eventually erupts into shocking violence. If you must compare this version to the 1963 film, then one of the positives links would have to be the strength of both casts. Like Brooks, Hook featured relative unknowns, and he should be commended for not "Hollywood-izing" Lord Of The Flies by populating it with a bunch of rugged and strong boys ready for adventure. The characters here remain frail and frightened, including default leader Ralph. All of the boys, even the tough 'Hunters,' can do little to hide their fear, and it is really Ralph's faithful second-in-command Piggy that is one of the story's truly memorable and touching characters. In the 1963 film, the doomed Piggy was played sweetly by Hugh Edwards, and Danuel Pipoly recreates that role just as perfectly here. I enjoyed this film immensely. It's really tough to screw up such a strong piece of fiction, and Harry Hook has done a fine job bringing much of Goldings' original novel alive. Perhaps not true to the letter of the novel, and perhaps not as unnerving as Brooks 1963 film, I think the message is still hard-hitting and told well. Image Transfer Review: Presented in a 1.85:1 widescreen anamorphic transfer, Lord Of The Flies looks very good overall. The abundant skin tones look natural, even during the scenes at night lit by firelight. Colors have a nice, even balance, but never appear overly vibrant. The source print is virtually blemish free, with only some minor graining evident during some of the night scenes. MGM's treatment of this classic tale has been more than adequate. Audio Transfer Review: MGM has issued this disc with a mediocre English 2.0 surround track that provides a fairly rich sound field, but is lacking where it counts. My only complaint is that the mix skimps on presenting any significant surround effects, relying on ambient island sounds, and those that are present are far too subtle. A more forceful 5.1 mix could have added a big dramatic punch to the overall experience. While the rear channels are generally overlooked here, the fronts present a perfectly clean canvas for the dialogue and the Philippe Sarde score. Extras Review: This disc is stripped clean of any supplements. Not a trailer or filmography to be found. 16 chapter stops and subs in French and Spanish are about the extent of MGM's offerings. 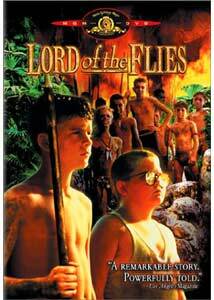 Lord Of The Flies is a powerful and disturbing story, and I think Goldings' novel has been treated fairly here. While this version may ruffle the feathers of some, I found this to be as engrossing and upsetting as the original film, aided by a fine cast of natural young actors. Highly recommended, even with a complete absence of any supplemental material.